Hot off the presses! Five hundred ribbons, all ready to go for your geeking pleasure. Here’s how to get some of your very own. Those who specifically requested ribbons for August/September events go to the head of the queue. After that, it is first come, first served. Once again, if you are wanting ribbons for any geeky events taking place in the Southeast over Labor Day weekend, please read this. There’s other exciting stuff coming up very soon, including a radio interview and an ad in a comic book. Stay tuned for more details on those! 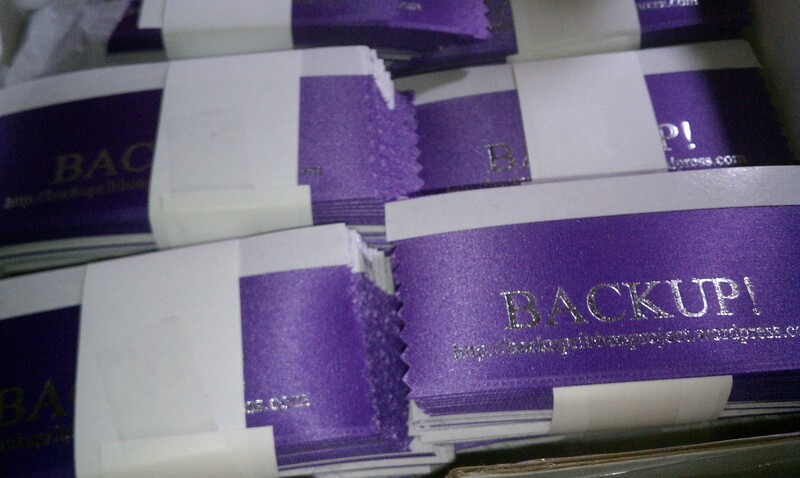 Finally, we love to see the Backup Ribbons in action, so take a pic and pin it to our Pinterest board!